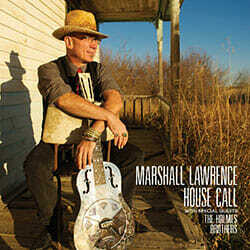 GREAT REVIEW of “House Call” in Blues In The Northwest out of the U.K.
Marshall’s interest in music was piqued at the age of ten in 1996 by rock and roll, inspiring him to ask his father for his own guitar; at this time the family moved from their home in Flin Flon, Manitoba, Canada to Windsor, Ontario. At the age of thirteen he was listening to Jimi Hendrix and making his own live appearances. Through his teens he eagerly expanded his knowledge and interest by listening to the likes of Chuck Berry and Johnny Winter while working in a car factory in Windsor, he later went on to Kingston to gain his Ph. D in Psychology; all the while absorbing a wide array of influences and styles ranging from blues legend B.B. King to Eddie Hazel from Funkadelic. After playing in various bands and in various styles he found over time that he was inextricably drawn to acoustic blues, one instrument in particular that he has mastered and has also had an overriding influence on his playing style is the mandolin, due wholly to the fact that whilst in Northern California in 1996 he could only find work playing in a bluegrass band named Tubtones. Now, after firmly re-establishing himself in Canada he has not only produced distinctive and singular albums but he has also created a picking sound like no other; the deep, haunting and resonating warm rolling tones of his picking combined with an upbeat voice combine to draw you into a rural world where getting your life on an even keel is somewhat of a victory. The endearing and mellow rhythms that Marshall envelopes you in cradles your thoughts into a timeless mixture of old time blues and Americana; some of the folk music played here, seems to possess at times a similar formality to that which is found in its English cousin. The wonderful downbeat vocals of Marshall on “Factory Closing Blues,” are sublimely backed by the beautiful despairing harmonies of the Holmes Brothers playing against guitar, chain and pipe. An urging Hammond organ and wistful harmonica drive the almost meandering “Please Help Me Find My Way Home,” While “The Ballad Of Molly Brown,” mixes a rolling, rising insistently toe tapping acoustic guitar with plaintive harmonica and joyously unbridled thigh slaps. The slowburning, wailing and dragging harmonica and guitar led “Rich Man, Can’t Get The Blues,” explains that no matter what or who you are the blues will still get you. The highly expressive harmonica of Dave ‘Hurricane’ Hoerl and stand-up acoustic bass of Russell Jackson are to the fore on the swinging and jumping “Hey Girl (Tired of Your Lying. )” The more respectful gospel / military nuanced drum on the traditional “Little Black Train,” invoke a more sombre mood.